This view of the lower front and underbelly areas of NASA's Mars rover Curiosity combines nine images taken by the rover's Mars Hand Lens Imager (MAHLI) during the 34th Martian day, or sol, of Curiosity's work on Mars (Sept. 9, 2012). PASADENA, Calif. - NASA's Mars rover Curiosity stepped through activities on Sept. 7, 8 and 9 designed to check and characterize precision movements by the rover's robotic arm and use of tools on the arm. The activities confirmed good health and usefulness of Mars Hand Lens Imager, or MAHLI, and used that camera to check arm placement during several positioning activities. MAHLI took an image with its reclosable dust cover open for the first time on Mars, confirming sharp imaging capability that had been obscured by a thin film of dust on the cover during previous use of the camera. It took images of cameras at the top of Curiosity's mast, of the underbelly of the rover and of MAHLI's own calibration target, among other pointings. "Wow, seeing these images after all the tremendous hard work that has gone into making them possible is a profoundly emotional moment," said MAHLI Principal Investigator Ken Edgett of Malin Space Science Systems, San Diego. "It is so exciting to see the camera returning beautiful, sharp images from Mars." Selected MAHLI images, with captions, are available at: http://1.usa.gov/PecY9c . Raw versions of all MAHLI images are available along with raw images from the other cameras on Curiosity at: http://mars.jpl.nasa.gov/msl/multimedia/raw/ . The camera's calibration target includes a 1909 Lincoln penny that Edgett purchased for this purpose. "We're seeing the penny in the foreground and, looking past it, a setting I'm sure the people who minted these coins never imagined," Edgett said. The penny is a nod to geologists' tradition of placing a coin or other object of known scale as a size reference in close-up photographs of rocks, and it gives the public a familiar object for perceiving size easily when it will be viewed by MAHLI on Mars. "The folks who drive the rover's arm and turret have taken a 220-pound arm through some very complex tai chi, to center a penny in an image that's only a few centimeters across," said MAHLI Deputy Principal Investigator Aileen Yingst of the Tucson-based Planetary Science Institute. "They make the impossible look easy." The arm characterization activities, including more imaging by MAHLI, will continue for a few days before Curiosity resumes driving toward a mid-term science destination area called Glenelg. In that area, the rover may use its scoop to collect a soil sample, and later its drill to collect a sample of powder from inside a rock. 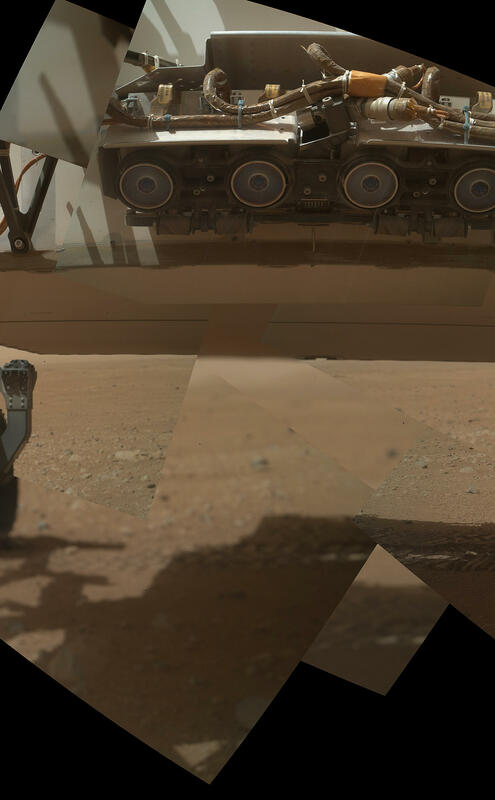 Curiosity is five weeks into a two-year prime mission on Mars. It will use 10 science instruments to assess whether the selected study area ever has offered environmental conditions favorable for microbial life. NASA's Jet Propulsion Laboratory, a division of the California Institute of Technology in Pasadena, Calif., manages the mission for NASA's Science Mission Directorate in Washington.